Guys,I am back to normalcy after a long time.After having written few long series and short series ,now I switch to single post.I'm infact glad and overwhelmed after reading your responses .I'm actually sorry for not updating "When V Met " series. For the last few weeks , I don't know why,but I feel like my mind has occupied the 7-11pm tv serial slot.Wait, is this any hormonal change or somethings wrong with me.Why the hell am I showing interests in TV Soaps?.God forbid! Well,a perfect delight to the week where Pakistan claim the world champions tag from India.Nevertheless ,they have shown this sporting spirit even in a turmoil like condition ad mist bomb blasts and other factors.All hail Pakistan team for winning T20WC and my favourite player "Boom Boom Afridi". Umm!Now let me write something about my favourite TV serials one by one. To be honest,I have never cried after watching a TV Serial.This programme had made my eyes moist.I never knew a serial would make me cry."Mumma! Yeh kya hua Bindiya ko,". The main protagonist of the show Bindiya is being harassed by her in laws after she was forcibly married to Vinay .This not so good marriage happened without her dads consent.Her dad was off to Patna when this illegal wedding occurred.Vinay was kidnapped by Raja,the rogue brother of the actress and one of Pappu's loyal aide.The emotional "gudiya rani"songs played during the scenes has to tendency to make anyone cry.The music scores are really brilliant.The female who plays Vinay's babhi is really malicious. Her looks and acts adds flavour to the show.I'm really glad that really good shows are being shown these days.Count me as a fan....hehe...I feel bad for Bindiya who now lives in a cow shed.Hope she will be fine.Colors:Monday - Thursday @7pm. Umm!this is an adaptation of the Argentine comedy show "LaloLa",which was shown on Firangi few days ago.Bhaskar,a ladies man uses girl like tissue papers.He was a flirt by nature who made fake promises to impress girls.Like this ,he approached Gita ,who was a simple girl.He used this experience to write an article about traditional girls for his magazine where he is the chief editor.Gita cursed him and wanted him to understand a woman.She turned Bhaskar into Bharati and the fun arrives.Sunny - Arman romance bit was funny.Amarjeets word of day is really stupendous.Hahaha! stupendous,context, conclusion, juvenile etc are few of the words which are used by Amarjeet to discuss his tactics. Sony TV:Monday to Thursday @9pm. Most popular show currently being telecasted by Colors.I like watching this show. The girl who plays Suguna is amazing."Haina". She is pregnant. God forbid.Shyam is in love with her.He even proposes her for marriage but Suguna refuses.Maajisa ,another flamboyant character in the serial along with the other protagonist.Super super exhibition of acting skills by really talented actors. Loved the way, it is scripted and I enjoy every bit of it. 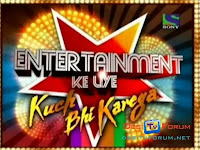 4.Entertainment ke liye kuch bhi karega. Aila! enough of tv serials.The Indian are going to take on the might Windies in their own soil.Gayle,the prince calypso doesn't wants to take this superstar deprived team lightly.MSD would or may try to experiment something new just like he did during T20WC . 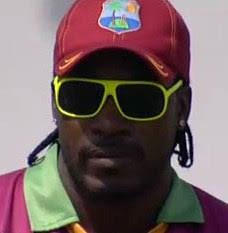 I just hope that we won't get humiliated once again.Vaise Chris Gayle is a cool customer. I'm actually in love with his new shades.I'm being honest guys.I'm searching for this yellow shades of his.God!mindblowing colorful it is. Kya dekhi hai aapne Gayle ka chasma. Waah! bhai kya color effect hai. ..hmmm nice u wrote dis so erly..
for Bharti Bhaskar I think Lalola was far bttr thn dis one..
your post is nice fusion of TV soaps & cricket..gud one..!! belissimo trabalho/sou apaixonado pela cultura indiana-parabens!!! Well now Mr gayle should know he has all the attention on his yellow glares. He sholud certainly get rid of it now. Good work dude.Nice Work of observation and opinion!Keep penning! Of all these..Bv is the only soap I watch..rather am forced to watch by my mom. Hate it though..never been much of a soap person if u ask me! Congrats on "more than 100" followers! !